No one in their right mind would start a journey without checking that their car was up to it or referred to a map or sat nav to check the route. So, before you set a fitness goal you must make sure your body (the car) is up to it and is filled with the right nutrition (fuel). Consulting a personal trainer or nutritionist is like consulting your Sat Nav which will provide the best route and advise if there are any problems which will affect the safe and timely arrival at your destination. Whether have just decided to start exercising or want to change your routine because you haven’t seen the results you expect you will need a tailored fitness plan to move forward at reach your fitness goals. Whether you goal is to lose weight, get more toned, train for a marathon, build strength, or just to improve your fitness levels a tailored fitness plan is essential. People can go to the gym for months and attend all the fitness classes in the world but still not see the results they want. A personal trainer can work closely with to gain an understanding of your current lifestyle, diet, and physical abilities before designing a tailored fitness plan created specifically for you. By researching what motivates you and setting achievable weekly goals your tailored fitness plan will enable you to track your progress. Your plan can be amended, and changes cab be crucial to keep you on track as well as keeping it fresh and interesting. 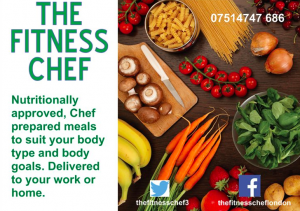 If you are looking for a tailored fitness plan contact the Fitness Chef in Moorgate, London. We have teamed up with an expert London based personal trainer and nutritionist to help create your personal fitness plan along with customised dietary advice based on your specific needs and goals. Whether you are a beginner, bored with your current fitness plan, or are training competitively we can educate you on how to get the most from your exercise and food to improve your level of fitness. It has never been easier to access a tailored fitness plan and order healthy meals online which can be delivered to your London gym, home or office in EC2, EC3 and EC4 addresses so checkout our healthy food menus and place your order online or Email for your Tailored Fitness Plan consultation.